For the first time ever, the legendary centenary production of Wagner's The Mastersingers, conducted by Reginald Goodall (above) and broadcast live from Sadler's Wells Theatre on 10 February 1968 is being released by Chandos on CD as a commercial recording. The 4-CD set is currently being re-mastered from the tapes of a BBC Radio 3 live broadcast from Sadler's Wells Theatre and is scheduled for July release. The cast includes Alberto Remedios as Walther von Stolzing, Norman Bailey as Hans Sachs, Derek Hammond-Stroud as Sixtus Beckmesser and Gregory Dempsey as David, and those of us who were privileged to see this production will remember it as a life-enhancing and life-changing experience. 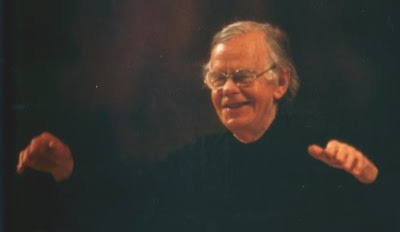 As I recounted in an earlier article the resounding success of the 1968 Mastersingers brought Reginald Goodall in from the musical wilderness and led to his conducting an 'English' Ring at the London Coliseum in the 1970s. This Ring Cycle was commercially recorded and released originally by EMI on LP, and after that company fell into the hands of accountants it was re-released by Chandos who are doing a magnificent job of keeping these great performances available. But please Chandos, can you do something about your website? It may be cutting-edge and allow the purchase of MP3 files, but the search facility is terrible. Which is why the link above to the Goodall Ring points to Amazon. It is very good news that this great 'lost recording' of The Mastersingers is at last being released commercially by Chandos to sit in their catalogue alongside that great English Ring. But it does beg the question why it needs an independent record company to exploit this legendary material from the BBC archive? What about the BBC's own appropriately named BBC Legends record label which already has some Goodall material in its catalogue? The BBC's reasons for licensing this priceless material to Chandos escapes me, but I'm quite sure they have nothing to do with the Goodall ENO Ring competing with the Covent Garden Heritage label's own Die Meistersinger recording which just happens to be released this month by the same company as is responsible for BBC Legends. Now read the full story in Reginald Goodall - the holy fool.